Non-enveloped, head-tail structure. The icosahedral head is about 80 nm. The tail of about 220 nm in length is contractile. Linear, dsDNA genome of about 35-40 kb, encoding for about 50 proteins. 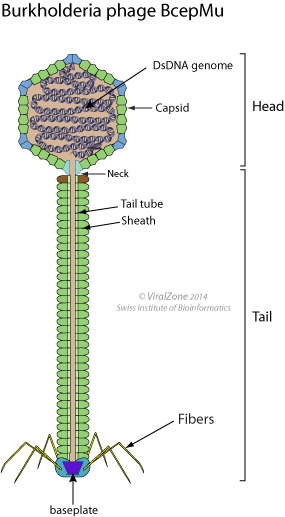 Bacterial DNA fragments are respectively covalently linked at the left and the right end of the viral genome.